This week has been busy, yet slow-moving. It’s been incredibly busy at work, but not as productive as I’d like. I’ve been spending a lot of time in wheel-spinning frustration while stressed that there’s so much on my plate. But tomorrow is Friday, so there is a light at the end of the tunnel. As much as I love blogging and reading blogs, after a stressful day in front of computers, I’ve been needing disconnected time at home this week too. Anyway, I’ve been having more cooked vegan dinners lately because I’ve been craving more protein with a stressful schedule of work and half-marathon training. But I have discovered a love for fresh corn, either in raw or cooked dishes. My corn zipper has really helped fuel my obsession making it easy to zip raw corn off the cob either into a skillet or salad fast. Ideal for a Mexican-themed tempeh skillet I threw together in about 20 minutes the other night. 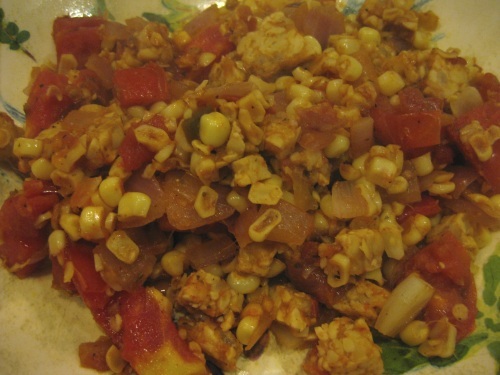 I cubed up a Trader Joe’s tempeh “loaf” and sauteed with a diced onion, diced tomatoes, corn and half a jar of Trader Joe’s salsa I had in the fridge to use up. I kicked it up a notch with a cayenne pepper dash for a fun, vegan skillet that was a quick throw-together after a busy day and made great leftovers for lunch. 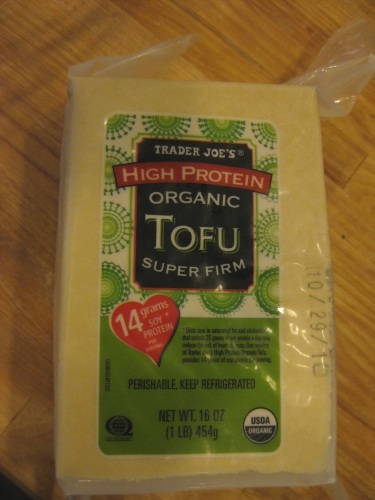 On my last trip to Trader Joe’s, I picked up a type of tofu I’ve never tried before. It was twice the price as regular tofu, but considerably higher in protein. It’s much more dense and not packed in as much water. Never working it before, I tried to press it ahead of time, but maybe only two drops of water came out because it’s already been pressed. Nice! 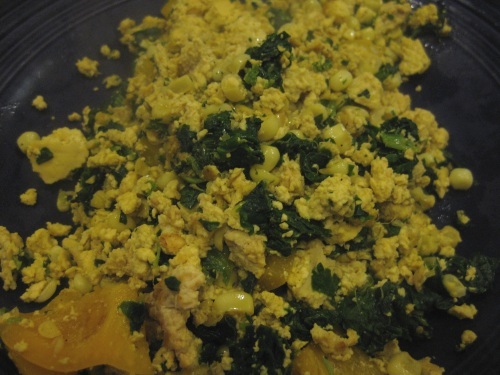 It easily crumpled by hand for a variation of Gena’s Tofu Scramble I did with corn instead of carrots. I also found this tofu more filling than traditional tofu keeping the hunger monster away longer. Being more filling, not watery at all and easier to work with, I would definitely buy it again. 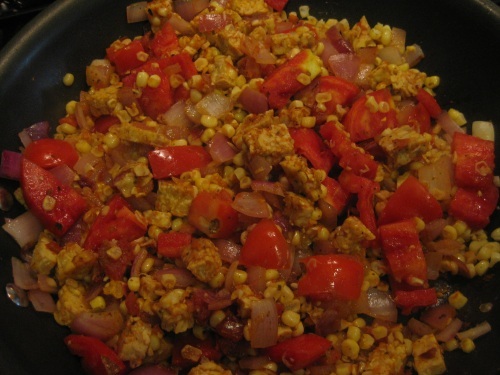 Also I really liked the corn mixed into the tofu scramble, it added a nice texture and flavor to it. I wonder how they get the extra protein in there?!! I guess it’s just more condensed? Anyway corn zipper. Another gadget i “need”! How fun!!!! Hope life is manageable and the week is flying by for you :) lord knows im in 5th gear all the time! haha! I’ve never seen that dense protein– I like that idea! 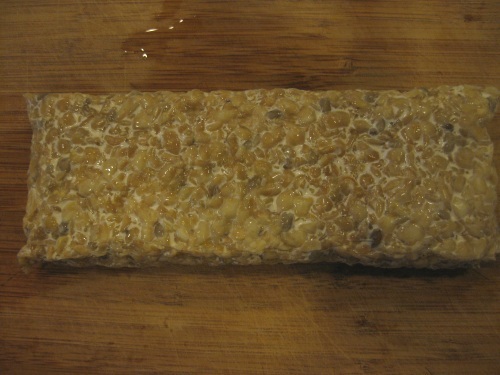 Thanks for the tempeh inspiration. I never know what to do with that ;).